As dog owners we all hear from Cesar Milan that he doesn't train the dog so much as he trains the owner. My experience with Candace was exactly the same. From the moment Candace met our little Izzy; she literally was hand feeding her and Izzy was following all her commands. Having said that, I think Candace trained me more than our Bichon Frise - Izzy. To give some background,Izzy was 5 years old when we got her in February 2012 and she had to adjust to her new lifestyle and we had to adjust to having a dog again. Candace provided full confidence that both Izzy and my husband and I could become "one" in no time. Candace stated many times that Izzy was a very smart dog which gave us faith that training was possible and our choice in picking Izzy was a good decision. Candace also reinforced every behaviour we did as Izzy's owners that was positive and likely to result in Izzy understanding what we wanted (e.g., sit,stay,come). There are times I looked very awkward with the training rope but Candace never laughed...she just kept on reminding me of the instructions and reinforcing me when I did it correctly. I have recommended Candace to family members who are looking for training services and I would recommend her to anyone no matter what the dog behaviour. Candace was very gentle with Izzy and her owners - it made me believe that training was possible. In the end it was perfect. 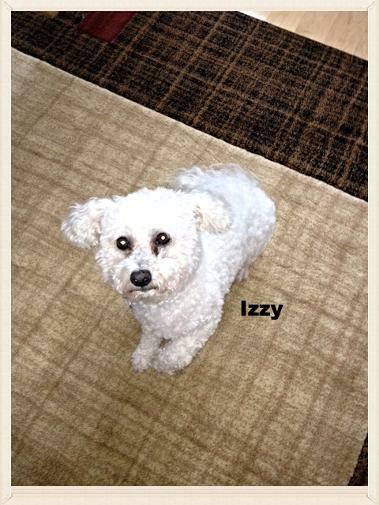 Izzy comes when I call her, she sits on command and stays. Candace, Thanks so much for your help. You are my "dog whisperer"